A lot of people think that those who suffer from a mental illness are in complete control, thus are wholly represented by the illness- Except they’re not. Having mental illness is not the sum of our parts, nor does it reflect with any accuracy our desire to do well in life, although it certainly impacts that. The first time I told someone I suffered from depression, they laughed. I was 22 years old. It was my cousin. We had this great plan to go on a holiday to California, and in that youthful exuberance we thought we’d see all the movie stars and go on the famous studio tours. And, suddenly, I couldn’t go. To this day, I replay that conversation in my head. At the time, I found it so bizarre that she didn’t understand what I was saying; “I WANT to do this. I cannot because of my anxiety.” I wanted to go. My mental illness didn’t. During that time of my life, for so many years, I was not free to do the things I wanted to do because I was living as a prisoner in my own mind. The individual with Mental Illness wants life experiences, relationships, a career, a family, to be a social butterfly, go to school, party on the weekends. The Mental Illness makes the rules in spite of them. Separate the person from their illness. This is why we become reclusive and alienate people. We live in a bubble of shame, oftentimes denying people access to us at our best, for fear they will experience us at our worst. We end up having to make excuses, and then be accused of making excuses for not doing or being who they expect we should be with minimal effort- because they can. In lieu of making excuses, in my case, I isolated myself. I severed myself from society so I didn’t have to explain why I was the way I was, how it happened, or why I can’t do the things they do; Things that I envied them for having the ability to do with great ease. It was easier to stay inside, in my own world. I was in complete control there. I had no one to answer to there. I had no one to disappoint. I never went back to school. I had a mother who found my presence more inconvenient than anything else and she didn’t bother with home schooling. From the Seventh grade onward, everything I know I taught myself. I wrote my first book in longhand at 16, just so I could create a world where I existed with purpose;; There were friends who liked me, I could do things teenagers do; Laugh, fall in love, have petty conflicts. I became a full blown agoraphobic. If I had to leave my house, I couldn’t do it alone. I would become paralyzed with fear for my own safety. I was certain I was being stared at. I believed someone would just accidentally catch sight of me from the corner of their eye and find me so offensive they might attack me- just because I was me. I had lived a life where, up until that point, that was all I knew. I was conditioned to believe that, out there in the world, I was a trespasser. I was an unwelcome figure, an alien, walking among people who belonged. I knew I didn’t belong. My mental illness wouldn’t let me. To them, it’s a choice we’re making. To those of us with anxiety, depression, or agoraphobia, it’s a curse we can’t escape. We must live with it, and often, despite it. Few people appreciate the fact that we are not in control, that we would love to go out and dance, or date, or attend social gatherings, but our spiraling thoughts prevent us from doing even such benign things. 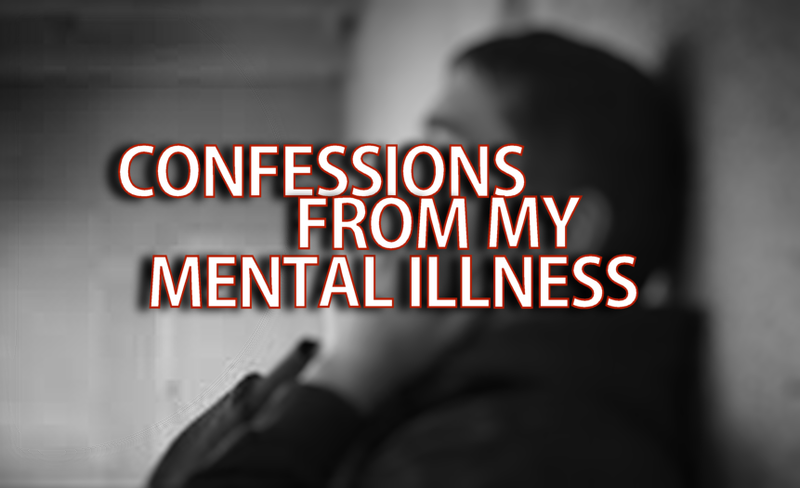 There is a difference between the consciousness of me and that of my mental illness. I’d love to do the things that it refuses to. That is not me being stubborn, weak or making excuses; It is my harsh reality. Don’t speak to a Mentally ill person as if they’re happy having it. It is never rewarding to have- it only costs us our potential. It never offers us happiness or great opportunities- it only takes them away. Don’t look at a mentally ill person and presume they’re living the life they imagined for themselves. We may have good days, appear optimistic, even enthusiastic about tomorrow, or that trip we’re planning together in a few months. That’s who they are in that moment, that’s what they want; They’re not being disingenuous. When the time comes and they withdraw, or they cancel on the dinner plans you made last week, it’s not because they’re unreliable or inconsiderate… it’s because, as much as they want to be the one making the decisions, they’re not. In the moments when we are living our life without resistance, we’re truly happy and being genuine with our intent- about those plans we make or that idea we had to do that one thing- but, when we are gripped by anxiety or depression, it goes in a vicious circle. Now we can’t. Now we’re locked in a stalemate with our fears, paranoia, anxiety, and we’re angry at ourselves as we rationally debate with our Illness, like we can simply talk to it with logic and reason, maybe even negotiate with it like a grounded child pleading with their mother to go outside and play with their friends. We try all of these things and because we can’t, we feel a loss of control, and then the depression doubles down, accompanied by the inevitable shame, embarrassment and humiliation that follows. So, we crawl back into the hallows of our shell. I remember watching Dexter, a series on showtime about a man who was a serial killer. He didn’t want to be, but his insatiable thirst to kill people was beyond his control, thus, he dubbed it his “Dark Passenger.” It’s a horrible analogy because, of course, most mentally ill people aren’t murderers, but I’d be lying if I didn’t relate to the concept of having a Dark Passenger of my own. An unwelcome guest influencing my thoughts, causing me to exist in a perpetual state of physical stress and anxiety; paranoia and panic attacks making me afraid of what’s going to happen to me if I do this; If I don’t do that, or if I mess things up. We do not process stress or conflict traditionally, it manifests in physical symptoms like nausea, visible shaking, the inability to sleep so we stay up for days or such an intense sense of urgency that, possibly, something horrible is going to happen, so we run. Most days, we can’t even tell you why- because we, ourselves, don’t want to run, we simply have no choice, not if we are to have a moment of peace internally. We have to go to places we are familiar with, often where there are faces we recognize. I’m known for creeping around in the middle of the night. Everything I do, including grocery shopping, I do at 3 am, after the world has gone to bed, but before the world wakes up. For some reason, the nighttime brings me comfort, like it swaddles me in darkness and protects me from the buzzing, busy life of daytime. Others are scared of the dark. Maybe you’re not scared of the dark, but I’m sure you know someone who is- and I’m sure if you ask them why, they wouldn’t be able to give you a logical answer that would seem normal or acceptable to your sensibilities. That’s why they call us crazy. A lot of us Trans people have had mental illness induced upon us. We’ve grown so familiar with fear that it has become an addiction. We rely on it; We need it to tell us when we’re not safe. Madonna once sang “Pain is a sign that there’s something wrong,” and that fear we experience is always telling us there’s something terribly wrong, or about to go wrong. It’s a short circuit in our wiring. It seems ridiculous to outsiders, who see me the same way that I see my cat who hides every time he hears a train whistle in the distance. Or, my dog who crawls under my desk, shaking, whenever we have a thunder storm. She’s Eleven, she’s heard them her whole life, yet nothing, not comforting whispers, promises that she’ll be okay or the gentle stroking of her fur can make her brain believe she will be. It is an automated response. Fear = Hide. We must save ourselves from whatever our brain says is out there, or to avoid whatever fate it claims will befall us. Over many, many years I have learned to better manage my Mental Illness. It still ebbs and tides, especially when something threatens my control over my circumstances or surroundings. As a Trans person who was abused for many years, I am keenly aware of my surroundings at all times. In a way, it’s been a bizarre gift in that it’s kept me from getting into much trouble. I know what happens to people like me in jail, where you have no sovereignty over your life or person. You have no control. That is the greatest fear of a person with anxiety- being unable to predict outcomes or control the situations they’re involuntarily placed in. Without that sense of control, instantly they feel vulnerable, terrified and removed from rational thinking. Their Mental Illness takes the wheel and dictates the directions. Sometimes, all one can do is stand there and cry, helpless. I am not ashamed of my Mental Illness. It’s taken it’s toll on me for certain. I was placed in an independent living facility at the age of 19 where I had complete control and absolute comfort in my environment. I felt safe in that little, one bedroom apartment. I say I got better only because there was nothing to agitate that “Dark Passenger” as my life was simple and uncomplicated; My days were predictable. I planted a garden, fed my parakeets (That my neighbors hated because the birds screamed ceaselessly at me day and night- my parakeets hated me, but they loved each other.) I lived vicariously through an online game as an Avatar so I had some semblance of living a real life, developing real relationships, having real conversations, although I was behind a keyboard. My safety net was the anonymity it provided me. Yet the people who knew me the least, somehow, over the 9 years I inhabited the skin of a faux person made of pixels, came to know me the best, despite never having seen me, been in the same room, state or even country as me. I was just Phaylen. A comedian, an animator, a voice online. I once heard a woman refer to our Avatars as soul wrappings. The world around us was blind to judgment based on skin color, age, gender, sexual orientation, disability — all we could be judged on was our quality of character and the value of our company. Nine years might seem like a long time to be a recluse, but believe me when I say, I went everywhere and achieved great things without ever leaving my house. That was me without my Mental Illness. That’s why I stayed there for 9 years. When I moved away, deciding to push back against my anxiety and depression with an intense determination, I made the huge mistake of thinking there would be a ceiling, like if I just kept going I would break through and be free! Safe and free! And my emotions would be my own. And then that day is gone. And they are far and few between for many of us. I’m back to the point where I’m learning to manage mine better, without complete control, although often I have to compete with the urge to panic by being louder than it is. I’m learning to find my limitations and push them a little further when the opportunity presents itself. Sometimes I reach beyond my grasp or misjudge what I’m capable of doing, even if in a moment of clarity I believe I can do anything. Because I want to be able to do anything. She’s right. Possessing the awareness of that is already winning. But these days, I repeatedly remind myself… don’t survive. You’ve proven you can do that. Every day that you can. One day, you’ll be gone.